Dr. Tom Norris is a world renowned shoulder surgeon with subspecialty interest in total shoulder replacements. Dr. Norris joined the San Francisco Shoulder, Elbow & Hand Clinic in 1978. 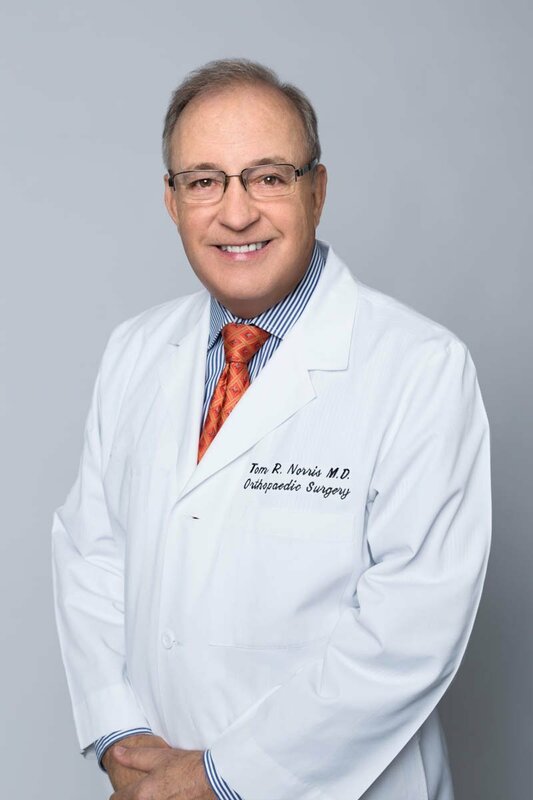 He is a founding member of the American Shoulder and Elbow Surgeons (ASES), and served as the organization’s president in 2001. He has been the Head Physician Consultant for Tornier, Orthopaedic Extremity Specialists, where he has contributed substantially to evolving the design of the reverse total shoulder replacement prosthesis. Dr. Norris is on the Board of Directors for the Journal of Shoulder and Elbow Surgery, and as the co-director for the San Francisco Shoulder, Elbow & Hand Clinic Fellowship¸ he trains two orthopaedic surgeons each year in surgery of the shoulder. He has also published numerous books and articles and teaches instructional courses throughout the world. Dr. Norris was raised in Texas and attended Princeton University for his undergraduate education. He received his medical degree from Columbia University College of Physicians and Surgeons in New York, NY. After an internship at San Francisco General Hospital, Dr. Norris returned to New York for his orthopaedic surgery residency at New York Orthopaedic Hospital, Columbia-Presbyterian Medical Center. After a fellowship in hand surgery at Thomas Jefferson University Hospital in Philadelphia, PA, and a microvascular fellowship with Dr. Jack W. Tupper in Oakland, CA, he once again returned to New York for further training in shoulder and elbow surgery with Dr. Charles Neer, II, a pioneer of the subspecialty. Dr. Norris is Board-certified Orthopaedic Surgeon and an active member of the American Academy of Orthopaedic Surgeons, the American Shoulder and Elbow Society, and the American Society for Surgery of the Hand. In his spare time Dr. Norris enjoys playing tennis, hiking, traveling, and spending time with his daughter.